I am honored to be one of this month's guests for the Hello Holo Customs group on facebook. 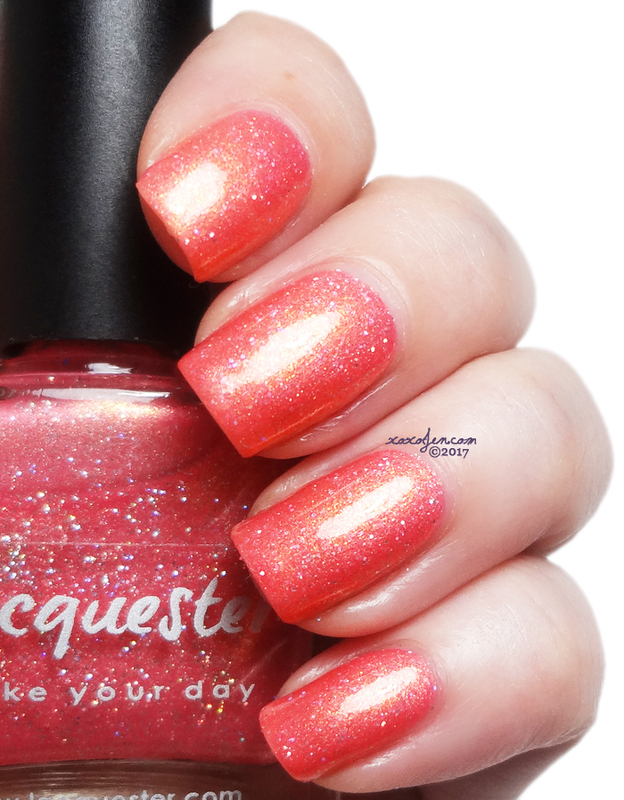 The brands featured in August are KBShimmer and Lacquester. 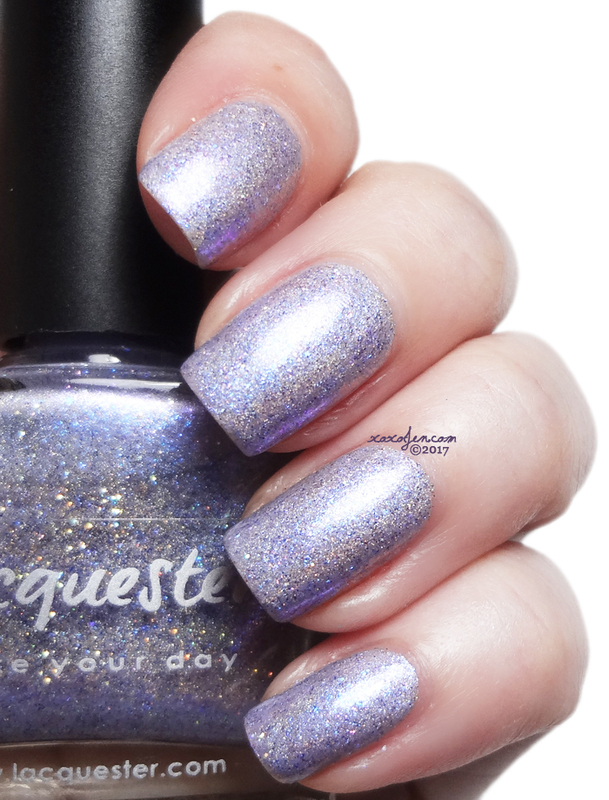 The pre-order launch is open now through September 5th and you'll need to be a member of Hella Holo Customs to get the purchase links for each polish. The color descriptions italicized are provided by the brand and my comments are beneath each of them. 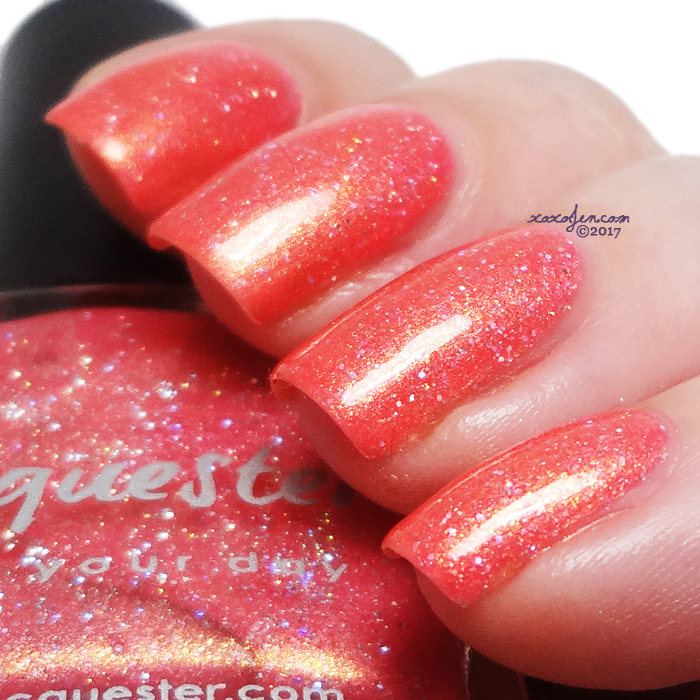 a coral based polish with gold shimmer, tiny (flat) holographic glitter and a subtle scattered holographic finish. Super vibrant coral, almost neon. The gold shimmer really pops in bright lighting. I wore three coats to ensure no vnl in photos, but it was mostly opaque in two. a spectraflair holographic base with lots of blue/violet and pink glow particles with a scattered holographic finish. Used with a top coat it will be totally smooth. 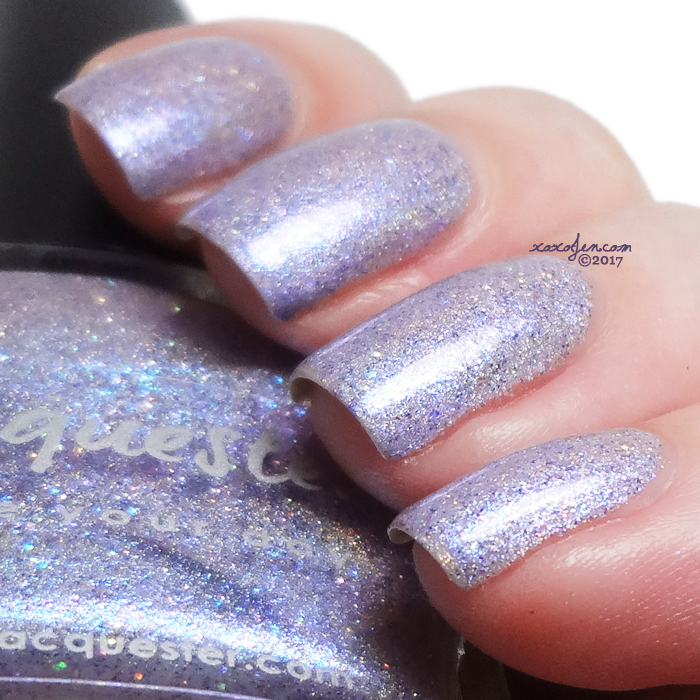 Absolutely stunning and super sparkly, this polish glows! I wore two coats with topcoat. a mint/blue base with gold/orange/red multichrome flakies, small holographic glitter and a scattered holographic finish. Used with a top coat it will be totally smooth. The base, to me, is a medium teal shade. Loving this one so much, I'm wearing it for Jason's birthday tomorrow. 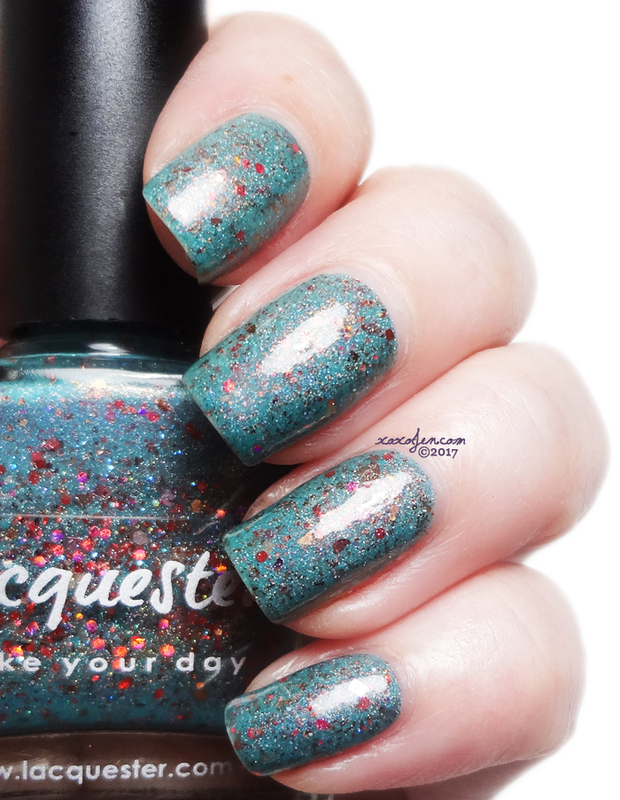 The shimmer, multichrome flakes and holo sparks add complexity and interest. I wore two coats and topcoat. 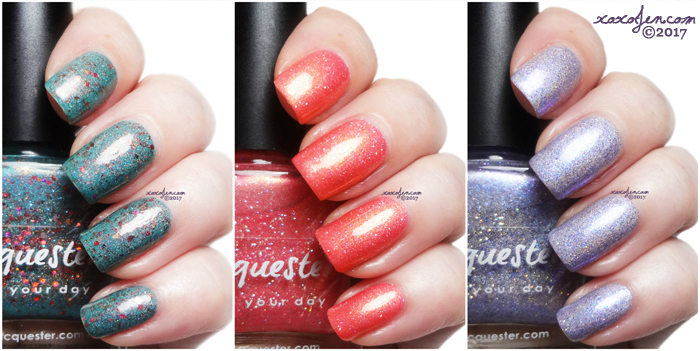 Each of these have fantastic formula, beautiful packaging and are opaque in two coats. I'm still wearing Poppy Like It's Hot, but I didn't notice any staining on removal of the other two. All were smooth to the touch after topcoat was applied. Also available are the polishes from KBShimmer that I reviewed yesterday. Join the Hello Holo Customs group on facebook to get the purchase links! The polishes are nice! I would totally wear all three too.